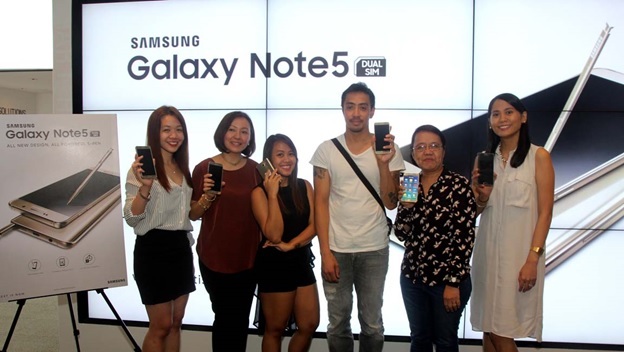 MANILA, Philippines - For these lucky individuals, it came as a surprise that on their booked Uber ride, they would come home with the latest Samsung Galaxy Note5. Without their knowledge, their booking made them instant participants of the Galaxy Note5 Luck 5 on A Ride Promo, where five lucky Uber riders were selected when he or she booked a car at select locations. It was truly a matter of being at the right place at the right time. Five lucky Uber riders went home with a Samsung Galaxy Note5, the only ultra-premium Dual SIM phone, through the Galaxy Note5 Lucky 5 on A Ride Promo, a partnership between innovation leader and Uber. The Samsung Galaxy Note5 is a true productivity tool with game-changing features such as an enhanced S-Pen, a professional-grade camera, and ultra-fast charging. Stephanie Sy, Marketing Manager for Uber Manila, poses with winner (from left to right )Katrina Romualdez, Diana Ecija, Justin Poniente and Fe Reyes. Joining them is Patty Rodriguez, Product Manager Head for Samsung Electronics Philippines (rightmost).